increased. In their life-changing new book, Why Good Things Happen to Good People, Dr. Post and journalist Jill Neimark weave the growing new science of love and giving with profoundly moving real-life stories to show exactly how giving unlocks the doors to health, happiness, and a longer life. The astounding new research includes a fifty-year study showing that people who are giving during their high school years have better physical and mental health throughout their lives. Other studies show that older people who give live longer than those who don’t. Helping others has been shown to bring health benefits to those with chronic illness, including HIV, multiple sclerosis, and heart problems. And studies show that people of all ages who help others on a regular basis, even in small ways, feel happiest. 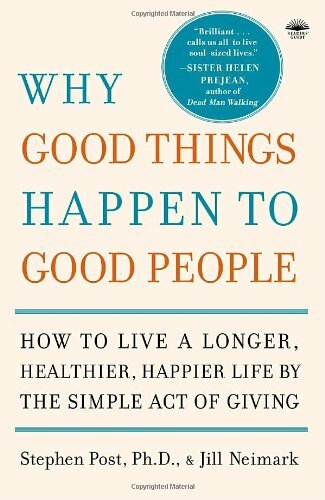 Why Good Things Happen to Good People offers ten ways to give of yourself, in four areas of life, all proven by science to improve your health and even add to your life expectancy. (And not one requires you to write a check.) The one-of-a-kind “Love and Longevity Scale” scores you on all ten ways, from volunteering to listening, loyalty to forgiveness, celebration to standing up for what you believe in. Using the lessons and guidelines in each chapter, you can create a personalized plan for a more generous life, finding the style of giving that suits you best. The astonishing connection between generosity and health is so convincing that it will inspire readers to change their lives in ways big and small. Get started today. A longer, healthier, happier life awaits you. Stephen Post, PhD, is a professor of bioethics at Case Western Reserve University’s School of Medicine. He is president of the Institute for Research on Unlimited Love, and his work has appeared in top journals such asJAMA,Science, andThe Lancet. Jill Neimark is a journalist, novelist, and former features editor forPsychology Todaywhose work has appeared inThe New York Times,TheEconomist, andDiscover.